>>Click here to watch the entire 2 hour documentary film now! Now more than ever before people all over the planet are seeking new sustainable models for living. EcoVillages and ecological communities have been emerging as a viable alternative where people can live together in cooperation and harmony with the natural world. 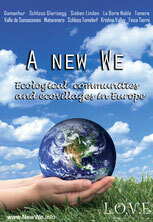 Please join the conversation and participate in evolving the EcoVillage model into the 21st century! The Austrian documentary filmmaker Stefan Wolf(aka Shin Veda) and his Team traveled through Europe in order to explore well established intentional communities and to present a broad spectrum of lifestyle possibilities to many people. "This film shows in an impressive and a touching way, that countless communities all around the world are already living „A New We“!"